I am interested in undertaking React projects. I am fairly new to it, but I am confident I can contribute in a React team. Feel free to contact me if you want to continue our conversation. Hey, Nicolas thank you for this awesome tutorial, it's was very helpful to understand the connection between both layers. I create my own project structure using KeystoneJS and react and was great! I'm using in my personal projects right now. [Thu Nov 08 2018 11:35:00 GMT+0100 (GMT+01:00)] "GET /list" Error (404): "Not found"
That's because the HTTP static server doesn't found the list file. I'm pretty sure that if you access directly to: yourHerokuServer/list you will find the same problem. I have a followed your approach but i am facing a issue. I have one home page route at express from which i want to pass through a middle-ware function isResturantOpen when ever the user visits the react app. but all the routes are being going to this main route. so now if i want to apply some different express.js middle ware functions on each different routes then how can i do this..? Can you please help me on this.? 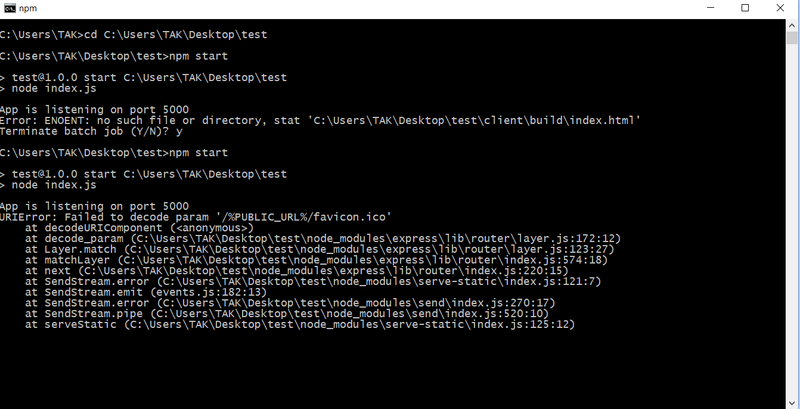 You would need to run npm start for both locally. It works in production as well, I'll add a section on deployment tonight. And when you C to terminate batch job, it will terminate both front and back localhosts. Thanks for the article. It seems that when I make the fetch request for the list at ('api/getList') I get a 404 error. It seems that the request is ignoring the proxy and trying to go to 'localhost:300/api/getList' rather than 'localhost:5000/api/getList'. I understand that one should never really unblock CORS. So my question is, how to I make get requests to my server? And what is the point in the 'proxy' if it does not solve this problem? Super helpful guide! Straight forward setup and introduced me to some technologies and concepts. Nicolas this is wonderful explanation. Keeping everything simple! Thank you! How can we publish in plesk? We have a shared server with Windows - I think with IIS - and node.js (if necessary)... Can you help us? Great article, Nicolas! It really helped me with a project I was hitting the wall with. Cheers.